My name is Darren Ethier. I was born on July 4, 1973 in a little town called Chapleau in Northern Ontario. 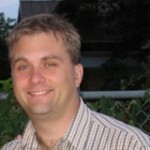 I am currently a freelance Web Developer and owner of a WordPress based development shop called roughsmootheng.in. I’m responsible for the entry of Organize Series into the world and lately I’ve joined the team at EventEspresso.com as one of their core developers. I am married to Kerryanne (August 17, 1996) and have 4 children. Zachary, Karissa and the twins – Liam and Jenna. I love my family! I like computers (web-design, programming, internet, video games, digital photography) and I like reading. I also like spending time outdoors. I also like being involved in ministry at my church. I am a Christ-follower. I truly believe that there is a sad stereotype associated with the word Christian in today’s world and I hope I can help in some small way to show Jesus to people who have the wrong idea of what being a Christian is all about because of this stereotype. I love God and have dedicated my life to Him. Well, that’s just a little bit of an introduction. If you do read through this blog you’ll probably get a feel for the kind of guy I am…however just remember sometimes what’s written will always be filtered through your perspective and hence you might not understand what I’m really saying from my perspective. Since this blog is a place for me to unfetter my mind (within reason of course lol) I am taking more liberties in what I post than what I might in a different forum. Any opinions I express in this blog are often actually part of a process of forming an opinion in my thoughts (and it’s worth saying that all of the contents of this blog are my own opinions and don’t necessarily reflect the ideas/opinions of who I may be working for or with). Some of this process I’m choosing to make public via this blog as a way of inviting others to “see into” my mind and maybe help me continue further in the process by putting forth their own opinions/thoughts. So if you don’t agree with something I’ve written or you’d like to contribute in some way feel free to either email me (click the Contact link) or post a comment to the blog entry. Of course other stuff I write is just for fun hehe. Well, that’s all I’m gonna write about myself for now..later!